Either way you wear it--as a shoulder bag or crossbody--this convertible All Saints silhouette is crafted from fine pebbled leather for an ultra-luxe look. Also available in Black, Blue and Grey and Burgundy. 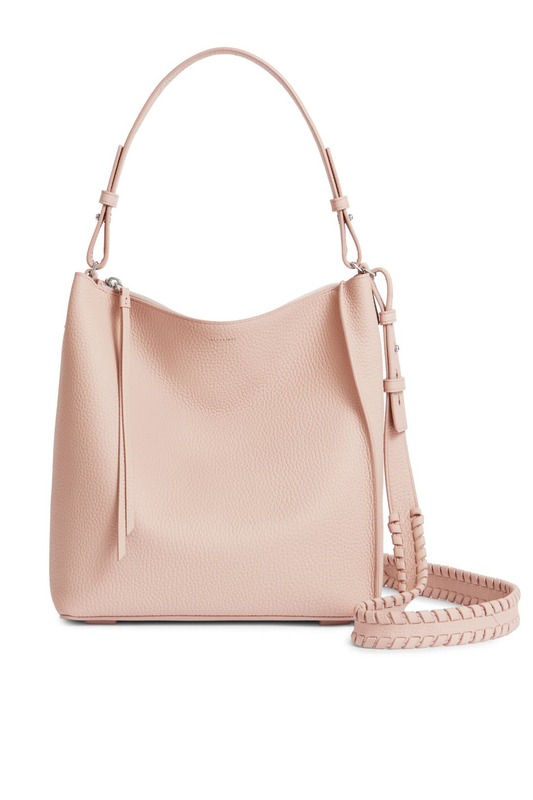 Peach pebbled leather large crossbody bag with whipstitch detailing. Top zipper closure and interior zipper pouch. Adjustable shoulder and crossbody straps. 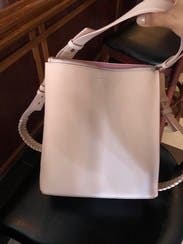 10.6"H x 9.8"W x 4.7"D.
Used this for everyday around town- cute blush color perfect for spring. Bag came in pristine condition!! 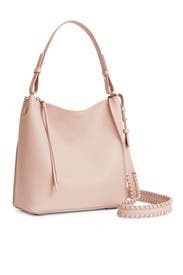 Pros: Beautiful pebbled leather in neutral peachy color-perfect for spring/summer. I loved that this had a top handle and an adjustable shoulder strap. I could fit quite a bit in here-considering it seemed small. Large wallet, phone, keys, another slim pouch with makeup and endless baby food pouches, sippy cup, rattle... :) Cons: This color is absolutely gorgeous, but I feel like you have to be really careful with it. I have experienced this in the past with other light colored bags that I have owned. It will show every little thing. A good leather conditioner/protectant can and will help this, but some color transfer from denim is inevitable.